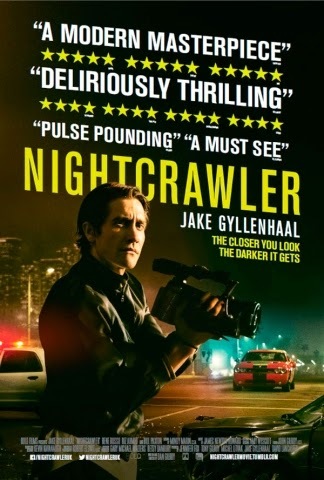 Marking Dan Gilroys directorial debut, Nightcrawler features Jake Gyllenhaal as a bizarre sociopath who is driven into a number of methods to earn money; one that particularly grabs his attention is the competitive and power hungry world of urban crime news. He ensures his success with blackmail and little to no compassion, leading to a dark path for those around him - but an aspired one for himself. For starters, Nightcrawler is beautifully filmed and superbly acted. Gyllenhaal's character is creepy and equally interesting, and he crafts these qualities with a strangely effective monotone delivery and animalistic curiosity. Tension in the later scenes is well constructed, sometimes pushing the film into horror genre territory, and Gyllenhaal's complete lack of empathy makes for some truly disturbing thrills, even if his performance sometimes overshadows the rest of the actual film. However, Nightcrawler is vague with its general plot, and sometimes it's hard to the principle focus. The ending does little to resolve several unanswered questions; this leaves the audience to interpret many character motives and meanings, which is always amusing, but sometimes a more solid conclusion is in order. With this in mind, Gilroys script is still original and clever; and despite issues with the general plot, a handful of fine performances and some great thrills make Nightcrawler an engaging if flawed experience from beginning to end.